Sometimes we all get a hankering for a snack. We might need a little bite to tide us over until lunchtime, food to munch on while we’re watching TV or a quick pick-me-up to get through an afternoon slump. Fortunately, there are tons of low-carb, keto snacks out there! Many of them are delicious and filling. Most recipes could double as appetizers at parties or nosh for a get-together. I have to admit, these are really pretty recipes too, like the avocado Caprese salad and the bacon and olive quiche. They would look right at home on any buffet table. Many of these snack recipes can be made ahead or in bulk, like the Instant Pot hard boiled eggs. This makes life simple for those of us who like to cook ahead and then keep a stockpile of snacks on hand for whenever cravings strike. 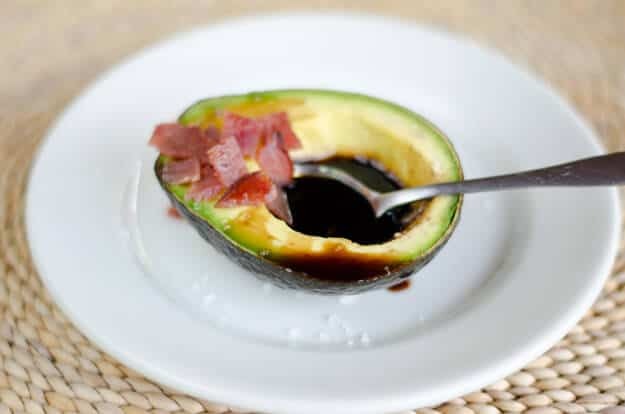 Here are 14 easy and delicious keto snack recipes to keep you full and happy! I love eggs and these snack recipes are my favorite. Eggs are so simple. They’re easy to find. They’re full of protein and they’re easy to store. No wonder we buy them by the dozen! Stock up on eggs for these easy keto snacks. Hard boiled eggs are about the easiest, most portable low-carb snack you can find. 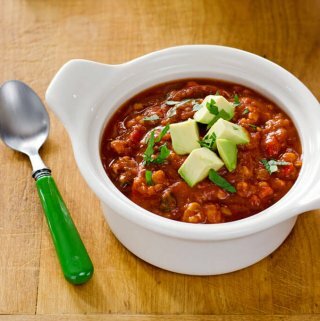 I love making them in my Instant Pot—talk about a total game-changer. It’s not so much that making eggs is faster in the Instant Pot, but it’s easier and they turn out perfect every time. Cook a bunch of hard boiled eggs ahead and store in the fridge for an easy go-to keto snack. 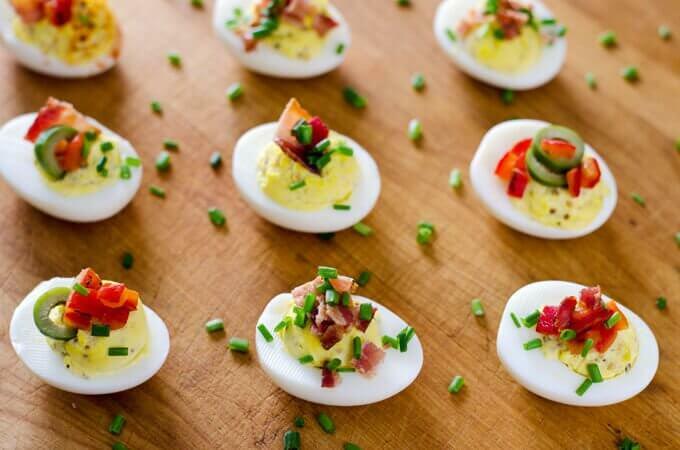 It’s no secret deviled eggs are a crowd favorite. Add bacon and I guarantee these will be snapped right up in the blink of an eye during your next party. Fortunately, using the hard-boiled egg recipe, you can make plenty to enjoy on your own as well. I always like to make extra deviled eggs to snack on. 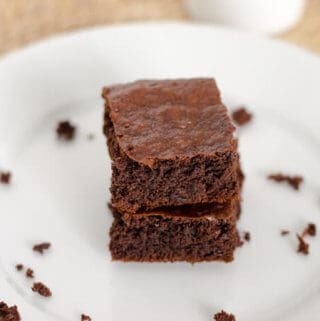 They’re so yummy and easy. This dish is one of my favorite representations of the best of both worlds: keto and paleo. It’s one of those recipes you could serve for almost any meal (Brunch? Dinner? Afternoon snack?) and it would go perfectly. When I make it, I save a few leftover slices in the fridge, which make a wonderful low-carb snack to enjoy when I need to power through the afternoon. Of course, the fact that this dish includes bacon means it’s often gobbled right up at dinner. That’s why you may want to cook two—one to eat now and one for snacking later. I must confess, avocados are hands down one of my favorite foods. They’re a beautiful color. They have a smooth, satisfying texture. They work across the board in all sorts of recipes and are even delicious on their own. Check out these recipes featuring the amazing avocado. 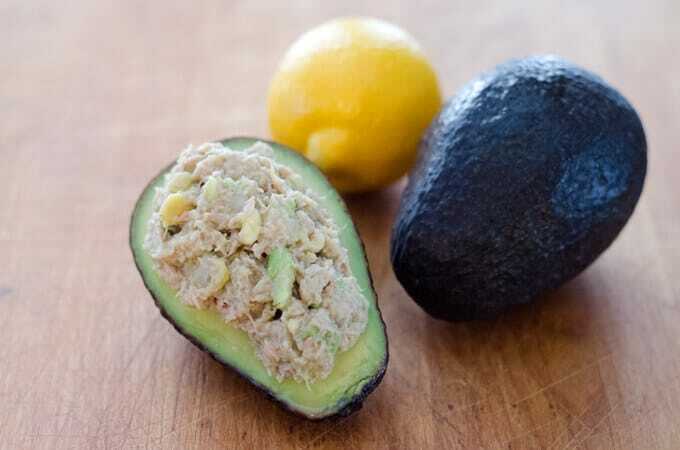 This avocado stuffed with tuna salad is perfect as a light lunch or a filling snack. It’s packed with protein and so filling. Thanks to the avocado, it feels indulgent and dressed up. It looks colorful on a plate and it’s a seriously beautiful and delicious snack. If you’re an avocado lover like me, you’ve got to try this recipe! Okay, so “technically speaking” this is a salad, but these little stackers are perfect for snacking on! They’re quite portable and come together fast and easy. This is a truly beautiful salad and a great example of how using fresh, whole ingredients elevates even a simple dish. With only three basic ingredients, don’t cut any corners—use the freshest, highest quality items you can find. This has to be one of my all-time favorite snacks. I keep avocados on hand, always, because they’re such a staple. They’re creamy, rich, and full of healthy fat. When you combine them with a nice aged balsamic and smoky, salty bacon…well, you have a snack that’s above and beyond. This has all the flavors to hit any craving. It’s simple, satisfying and delicious. It looks beautiful when sliced and served on a plate (but it’s perfectly acceptable to spoon it right out of the avocado half when you’re on the go). I often use guacamole as more of a sauce than a dip, but this is the perfect base recipe for guac. You can add fresh cilantro, roasted garlic or other add-ins to ramp up the flavor (and even the spice if you want a little kick). Guacamole is a great treat to bring to parties and potlucks as well. I guarantee the bowl will be gone before the party’s over! 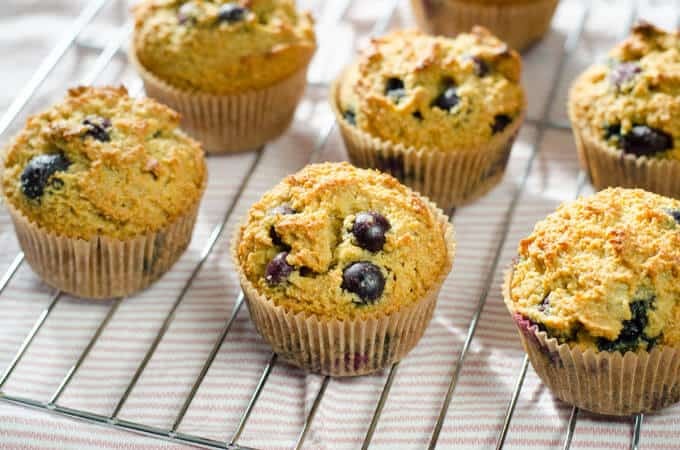 Whether you’re looking for a snack for yourself or a treat to bring along to a gathering, these keto recipes will cover all your bases. Dips are the universal party snack. They’re versatile, add flavor and are often very low in carbs. 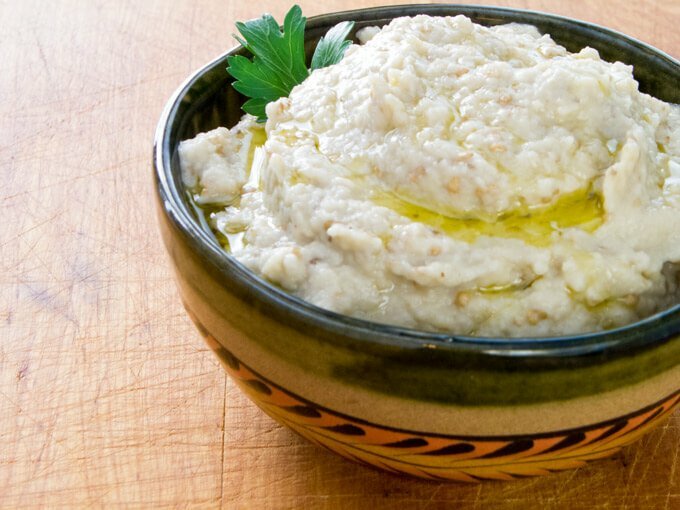 If you’re looking for dips to add to your repertoire, try these! Roasted garlic has a milder flavor that goes oh-so-well with eggplant in this creamy dip. The flavor is slightly exotic, so this dip will definitely stand out at a party or event. At the same time, it’s a great choice because it’s keto, paleo, and naturally dairy-free. It will satisfy nearly every guest. I love to use this as a sauce as well as a dip. I use cucumber slices or pepper strips which really compliment the flavors of the baba ganoush. Here’s another snack I like to double up on. When we get out the grill, adding an extra eggplant or two takes almost zero effort. Yet the results are absolutely mouthwatering. Like many of the dips here, this grilled eggplant and roasted red pepper dip is a great topping for chicken or fish, as well as a dip for vegetables. The grilling gives it a completely different flavor profile than the baba ganoush. This dip is chunkier, smokier and heartier (but still delicious)! It’s nice to see cauliflower finally having a moment. Between cauliflower rice, cauliflower mash, roasted cauliflower, and dips, it seems there’s nothing this humble vegetable can’t do. With more people turning toward low-carb, paleo and keto lifestyles, this veggie is finally getting the appreciation it deserves. Here, it stands in for traditional chickpeas in a delicious, spreadable dip. Salsa is a snack staple many of us like to make and keep on hand. Enjoy it with leftover chicken, fish or beef. Put together lettuce wrap tacos or use this super fresh salsa as a dip for vegetables. This salsa uses all the garden-fresh flavors of summer: tomato, onion, jalapeno. It comes together in a flash, and once you make it, I promise you’ll never want to buy the jarred stuff again. It’s so good! Sometimes you need a simple snack solution. These flavor-packed keto snack recipes use only a few ingredients and come together with very little preparation. 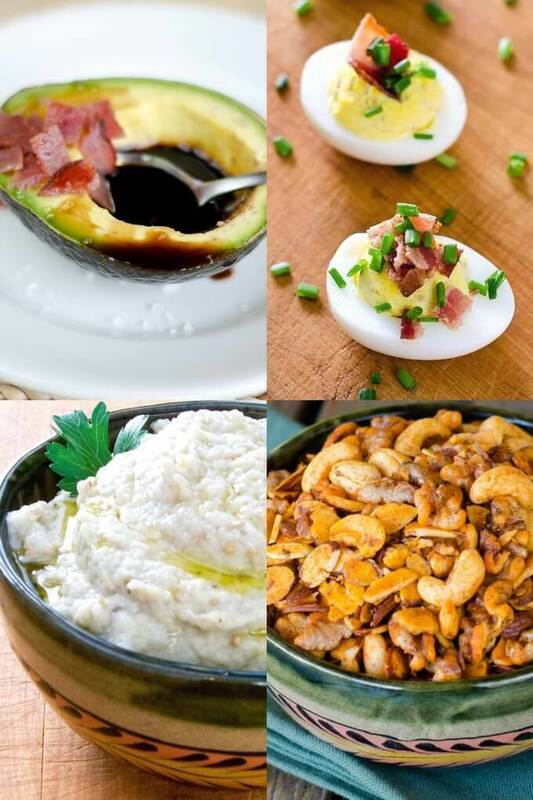 If you’re looking for something to munch on, check out these easy keto snack ideas. RELATED: 17 of the Best Keto Snacks to Buy Right Now! 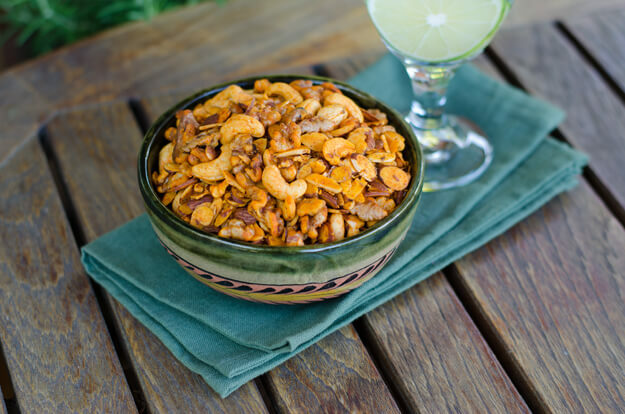 This paleo snack mix is low-carb and keto-friendly! It’s the perfect answer when you need to grab a quick handful to munch on in a rush. Mix up a big batch all at once and store it in an airtight container. This grain-free, dairy-free mix has plenty of spicy goodness to keep you coming back for more. It’s a great treat for guests to snack on. Looking for a snack you can really dig into? Kale chips are the perfect crunchy, satisfying snack any time you want to munch. These are great for chowing on while you watch TV or if you’re looking for a salty, crispy treat. I like to roast them low and slow in the oven, so they dry out and get extra crispy. Use any seasoning combinations you like to flavor these yummy chips. Shrimp cocktail is a delicious low-carb snack. I buy frozen deveined shrimp that are ready in a few minutes in the oven. If you’re having shrimp for dinner, roast a few extra to enjoy for tomorrow’s mid-afternoon snack. With shrimp cocktail, it’s all about the sauce. I have a low-carb version of cocktail sauce here, I whip together to add the perfect spicy kick to my shrimp! Hopefully, this covers all your keto snack bases. These keto-friendly snacks are also low-carb, paleo and Whole30 friendly as well. 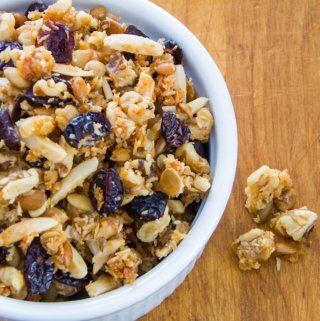 If you’re looking for great keto snack ideas, we’ve got your cravings managed.